This is a one-semester, three-credit course during which students will write their thesis, the culminating project for an M.A. in Language & Literature. In close consultation with a Director, students will write and revise a thesis ranging between 10,000 – 15,000 words (excluding bibliography, figures, and notes). This is a suitable length for presentation at a scholarly conference or publication in an academic journal. The standard length for a Language & Literature Thesis will be 10,000 – 15,000 words (excluding bibliography, figures, and notes). This is a suitable length for presentation at a scholarly conference or publication in an academic journal. Students with aspirations to write a longer thesis should discuss this with the thesis coordinator early in the process and again with the Director throughout the thesis process. Non-traditional formats or delivery mechanisms – such as critical editions, commentaries, digital humanities projects, and translations – are possibilities that can be discussed with the thesis coordinator before beginning the first semester of their thesis work. Both the Director and the Second Reader will offer assessments of the Thesis; the Director will do so throughout the process, especially at the draft and final revision stages. The Second Reader will do so only once at the end of the second semester. Students will have to satisfy their Director’s academic standards for sufficient graduate-level work. All work will be graded by the Director on a Pass/Fail/Honors basis. Week 6: Students will produce an initial draft of their entire thesis essay by Week 6 of the course and submit it to their Director, who will read it and return it with comments in a timely fashion. Week 9: Student will revise their thesis, following their Director’s recommendations, and submit a second draft by week 9 to both the Director and the secondary reader. TheDirector and the secondary reader will read it and return it with comments again. Week 12: Students will complete final revisions and submit the final, polished version of the thesis to the Director for final assessment 12. During the last stages of revision or after the Thesis has been completed, students will be invited to participate in a Thesis Theater, a conversation about the student’s thesis. These chats are free and open to the public, presented using audio and video Signum’s classroom interface, and they will be recorded, archived, and made publicly available. Students are expected to consult with their Directors about possible venues for conference presentation and subsequent publication of their thesis. 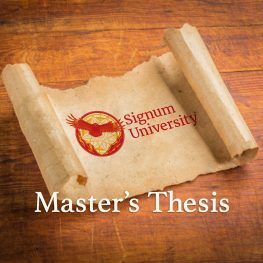 The thesis will be archived in the Signum library.